We are very excited about these puppies. 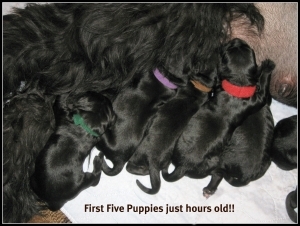 This litter is the culmination of our foundation lines in this one breeding!! We are very excited to keep a girl from this litter to go forward with. Allison and Doug McCormick are getting a girl from this litter to start their Black Russian breeding program with. We are delighted that our lines will go on!! Watch for this new BRT "Kennel" !